Dog bites happen for all kinds of reasons, for instance, your puppy might playfully nip at you or a scared dog may truly bite your hand when you go to pet it. Dog bites range from the very minor to some very serious injuries. 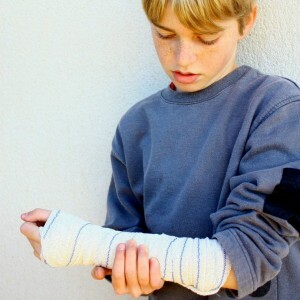 How to treat the bite depends on the circumstances and the severity of the injury. If the dog bite victim is bleeding profusely, has lost a lot of blood, or is severely injured, call 9-1-1 immediately! In general, here are some tips to help you take care of a more minor to moderate dog bite injury. Clean the bite site. Gently wash the site of the bite and hold it under water for a few minutes. This will help to rinse away any potential bacteria from the dog’s mouth. Then use hydrogen peroxide or isopropyl alcohol to finish cleaning. Cover the bite site. Gently pat the site dry, apply a topical antibiotic ointment and put on a bandage. As mentioned, if the dog bite victim is bleeding profusely, has lost a lot of blood, or is severely injured, call 9-1-1 immediately. 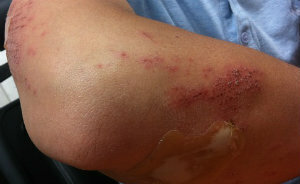 Encourage the wound to bleed for about five minutes, which will help prevent bacteria from entering the bite site. Then begin to control bleeding by applying gentle pressure directly to the wound using a clean cloth or towel. If there is a lot of blood, you may want to elevate the injured area; however, if you are not able to stop the flow of blood, you will want to call for emergency help. It is NOT recommended to use rubbing alcohol, hydrogen peroxide, iodine, or Mercurochrome for puncture wounds. These can slow the healing process. Typically, puncture wounds do not need to be bandaged; however, if you do, be sure to clean the wound thoroughly. If you don’t know the dog that bit you or your child. It is possible a rabies shot may be needed. If the wound looks very deep; the doctor may want to start a short course of antibiotic medication. To find out if you or your child are up-to-date on your tetanus shots. If you notice signs of an infection such as redness, swelling, warmth, pus, running a temperature, and swollen lymph glands. If there is a pre-existing condition such as diabetes, that makes a person more susceptible to infection. Whether a simple scrape or a puncture wound, be sure to clean and disinfect the wound thoroughly. Bacteria live in a dog’s mouth and can be transmitted to the wound, making a minor scrape a more serious condition by causing an infection and spreading bacteria to other parts of the body. Be sure to ask the dog’s owner if the dog is up-to-date on his or her vaccinations. You want to make sure the dog does not have rabies. If you or your child was bitten by a strange or unknown dog, be sure to contact animal control as soon as possible. Signs to be aware of with a rabid dog include overt aggression and attack behavior, behaving in a strange way or seeming to be partially paralyzed. If you or a loved one has been the victim of a dog bite, find out if you can hold the animal’s owner liable for injuries suffered. Contact our dog bite lawyers in Kansas City for a free, no-obligation case evaluation. What are some of the specific symptoms of rabies in dogs? Veterinarians keep dogs quarantined in a locked cage for ten days. This is the only acceptable method for confirming suspected rabies infection. However, rabies can be confused with other conditions that cause aggressive behavior, so a laboratory blood analysis must be conducted to confirm the presence of the virus.